Can Facebook, the popular social networking site, solve America’s blood shortages? The mission is to improve communities’ local blood supplies by amassing a network of blood donors across the United States and then we send personalized alerts targeted by geography and blood type when our users are needed to donate. About 43,000 pints of blood are donated each day… Total donations aren’t adequate to satisfy demand, though, and shortages occur regularly. When a patient is in need of blood that isn’t available, it becomes a life and death situation. Historically the Red Cross will make efforts to alert the public during a shortage. But there may be a better way – leverage the social networks to get the word out. If shortages of a certain type of blood occur in a certain zip code, having a database of willing donors in that zip code to contact may be the most efficient way to solve the problem quickly. The group’s Facebook application just launched here; it currently has 19 "fans." Facebook, which has 65 million users, also ranked near the top of a new report listing which companies collect the most data on consumers. Accoring to comScore, a research firm, Facebook collects data on each user an average of 525 times per month. Yahoo collected data the most often, at 2,520 a month, followed by MySpace, AOL, Google and then Facebook. As users upload private and medical information, of course, these companies have an even greater duty to protect privacy and proactively disclose how they collect, use and monetize that information. 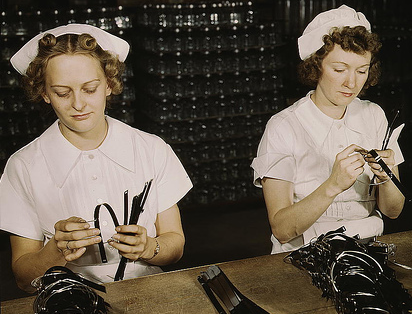 Photo Credit from The Library of Congress: "Two Navy wives, Eva Herzberg and Elve Burnham, assemble bands for blood transfusion bottles at Baxter Laboratories in 1942."